The number of ways in which humans interact with animals is almost incalculable. From beloved household pets to the steak on our dinner tables, the fur in our closets to the Babar books on our shelves, taxidermy exhibits to local zoos, humans have complex, deep, and dependent relationships with the animals in our ecosystems. 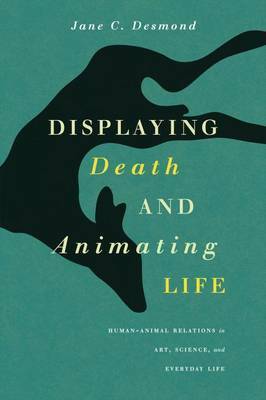 In Displaying Death and Animating Life, Jane C. Desmond puts those human-animal relationships under a multidisciplinary lens, focusing on the less obvious, and revealing the individualities and subjectivities of the real animals in our everyday lives. Desmond, a pioneer in the field of animal studies, builds the book on a number of case studies. She conducts research on-site at major museums, taxidermy conventions, pet cemeteries, and even at a professional conference for writers of obituaries. She goes behind the scenes at zoos, wildlife clinics, and meetings of pet cemetery professionals. We journey with her as she meets Kanzi, the bonobo artist, and a host of other animal-artists all of whom are preparing their artwork for auction. Throughout, Desmond moves from a consideration of the visual display of unindividuated animals, to mourning for known animals, and finally to the marketing of artwork by individual animals. The first book in the new Animal Lives series, Displaying Death and Animating Life is a landmark study, bridging disciplines and reaching across divisions from the humanities and social sciences to chart new territories of investigation.